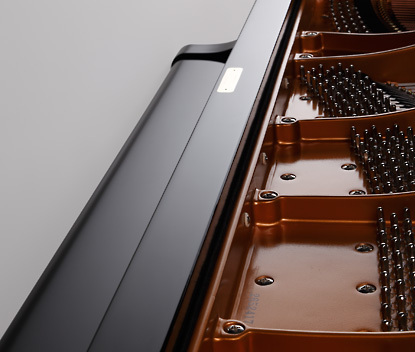 The advanced Millennium III keyboard action incorporates ABS-Carbon materials to further improve one’s playing experience. 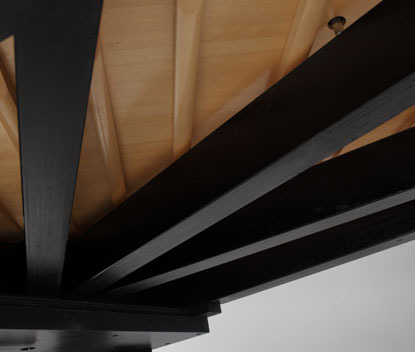 ABS-Carbon is both highly rigid and extremely lightweight and has long been used in the aeronautics industry as a superior alternative to wood. The use of ABS-Carbon makes the GX Series’ keyboard action more durable and less prone to performance degradation over time, while also delivering improved responsiveness and control. 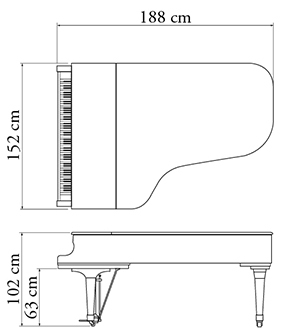 This evolution in keyboard touch can be experienced by the pianist with every key stroke. Our exclusive NEOTEX key surface material made of cellulose fiber offers the smooth, understated texture of natural ivory and ebony – and a semi-porous, silica-filled surface to absorb the hand’s natural oils and perspiration. Since NEOTEX is used for both the sharps and naturals, the feel of the keys is consistent across the entire keyboard. NEOTEX resists cracking and fading over years of use and is static-resistant to help prevent the build-up of unwanted dust. The result is a beautiful, long-lasting key surface with exceptional playability. The hammer rail is the “spine” of the piano’s action. GX series hammer rails are made of durable extruded aluminum with our exclusive Dual-Beam design for strength and stability. Both the hammer rail and the wippen rail are permanently locked in place to preserve the exacting tolerances of the action design and ensure consistent touch over the life of the piano. The entire surface of the hammer rail is finely serrated to hold each hammer flange securely in place for optimum hammer alignment, while the hammer flanges secured to the surface are made by PBT resin that enables the action screws to remain tight without shrinking and swelling. All these meticulous design features comprise the GX Series’ rigid foundation, ensuring a precise key stroke over time. The soundboard is the heart of a piano. 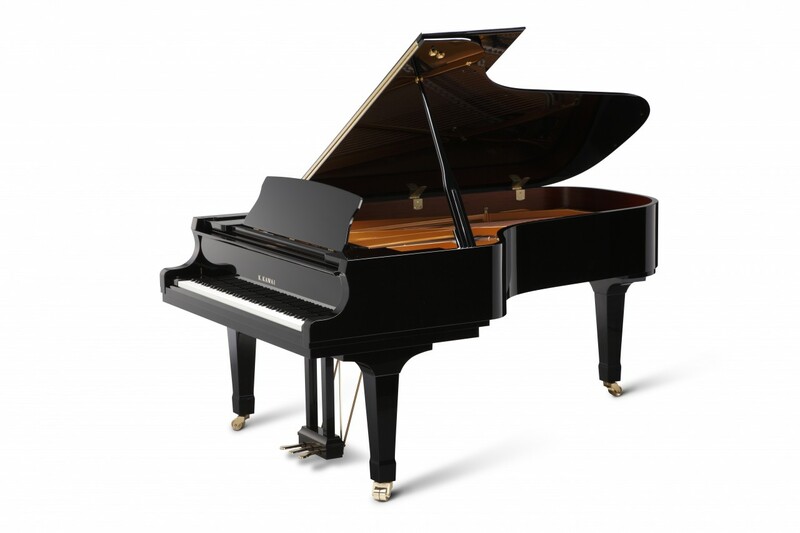 Its purpose is to transform the vibrations of the piano’s strings into a rich, resounding tone. 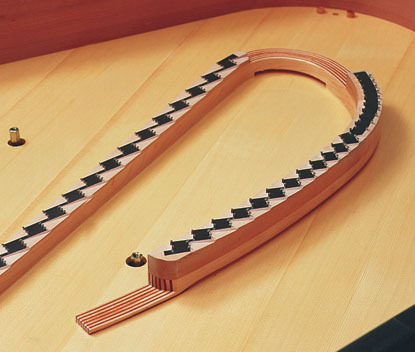 Kawai uses only straightgrained, quarter-sawn solid spruce for GX series soundboards. Each one is strategically tapered to provide the proper degree of resonant movement in each region. 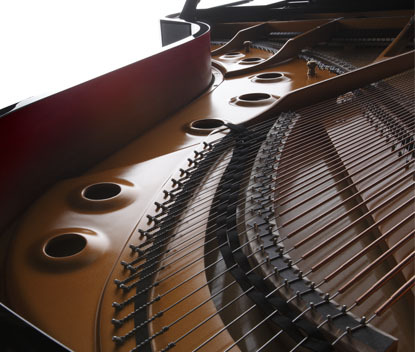 Only soundboards that meet or exceed our demanding resonance standards are selected for use in the GX series grand pianos. 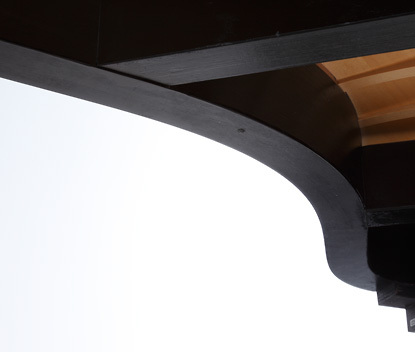 The exclusive Konsei Katagi rim uses a blend of distinctive hardwoods to achieve an ideal balance of tone. For the inner rim, small-pored hardwoods that provide superior brightness and projection are interlaminated with dense, large-pored hardwoods offering warmth and fullness. 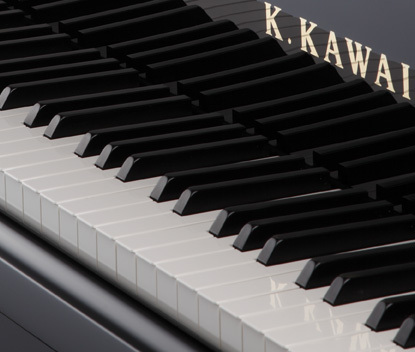 This synergy of structurally divergent hardwoods produces a powerful, well-rounded richness of tone that is the hallmark of Kawai pianos. 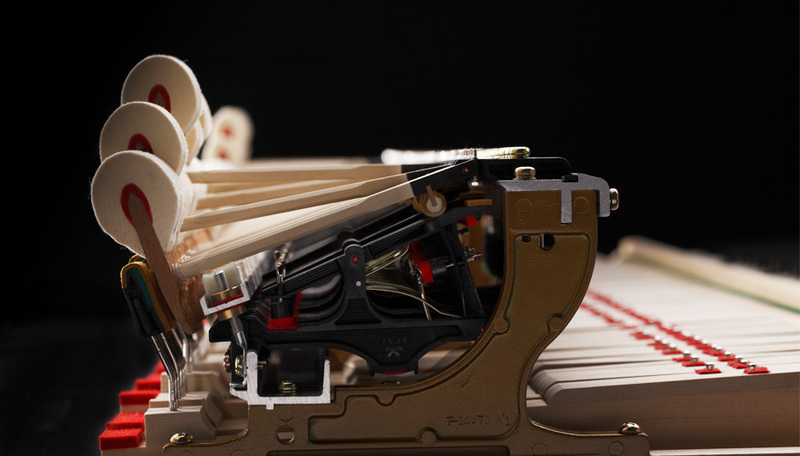 The bridge performs the vital task of transferring the vibrations of the strings to the soundboard. GX bass bridges are made of the highest quality hard maple or beech. Treble bridges are vertically laminated with 13 layers of maple and mahogany for maximum strength and optimal transfer of sound energy. The GX-7 features a single, continuous bridge that helps to smooth the transitions between bass and treble registers. Preserving the treasured design of a grand piano, while pursuing new details of elegance – this is the design concept of the GX Series. 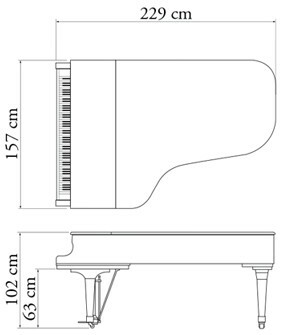 The instrument’s exterior design, with its gentle curves and broad music rest, establishing the traditional characteristics and captivating form of a grand piano. 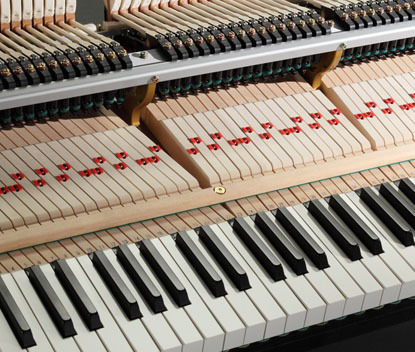 Expanding the instrument’s upper-beam thickness not only reinforces the piano’s overall structural rigidity, but also serves to further distinguish this exterior design, with Kawai’s highly prized painting and finishing process affording the piano body its distinctive, luxurious ebony polish appearance. However, the beauty of the GX Series truly shines upon opening the instrument’s top-board. 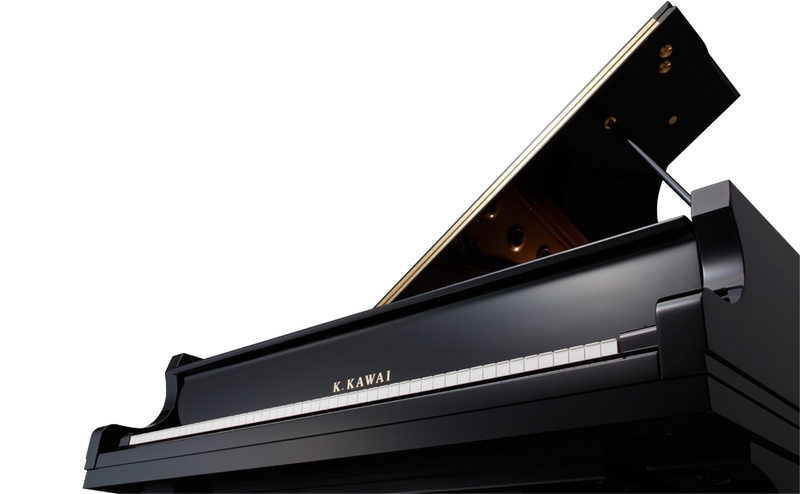 The mesmerizing brilliance of the glowing golden frame, the delicate woodwork and abundant expression of quality displayed along the inner rim, the luxurious elegance of rich black felt, and the reassuring display of hand-made craftsmanship – verified by the Kawai frame mark. These are the characteristics that embody the spirit of “THE GRAND”.